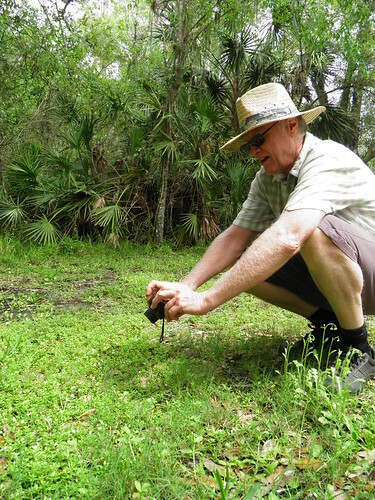 This low-growing native herb is found in wet areas across Florida. It is rather common in most counties, yet is rare to non-present in the very far north-central part of the state, near the Georgia border. I know a number of Vietnamese gardeners here in Florida who cultivate it in wet parts of their gardens as a very bitter salad ingredient. It is a well known herbal medicine, especially in Indian Ayurvedic medicine, having been used for thousands of years to treat asthma, ulcers, tumors, epilepsy, etc. In modern times it is often prescribed as a nootropic for helping with memory loss, dementia, learning and cognition issues, and even Alzheimer's Disease. Those suffering from epilepsy and depression would be wise to look into this plant. Refer to webmd.com for a list of side effects before ingesting, which includes avoiding if you are pregnant. 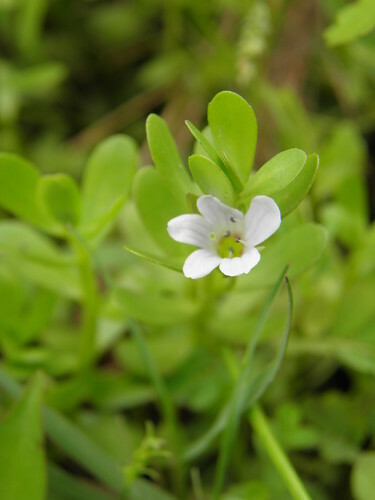 I sure would like to see a Florida herbalist make some soap with Brahmi as a major ingredient as it contains saponins and has been made into soap traditionally. 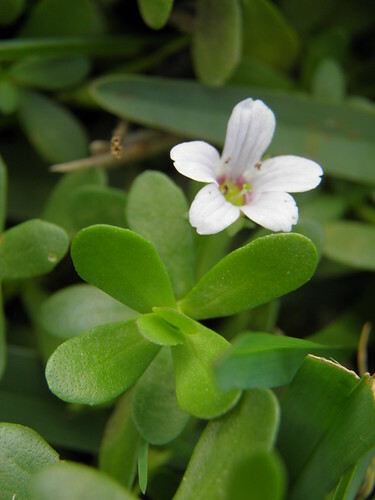 It is very easily confused with Tropical Water Hyssop, Bacopa innominata, which also grows, less commonly, in scattered counties across Florida. In fact, I must look into the differences with the aid of Prof. Wunderlin's keys, as some of my photos may prove to be innominata. Yet another native, the Swamp Twinflower, Dyschoriste humistrata, is also similar looking, having more of an upright habits an more elongated leaves. Please note that Gotu Kola is also known as Brahmi at times, so do not confuse the two. Lastly, the White Peacock butterfly lays its eggs on this species. CAUTION: Although it is cultivated as a raw salad topping, especially by Vietnamese gardeners in Florida, know that it is quite bitter, and you should try just very small amounts mixed into a salad at first. Gotu Kola is also known as Brahmi at times, so do not confuse the two. CAUTION: Refer to webmd.com for a list of side effects before ingesting, which includes avoiding if you are pregnant. It contains saponins, which should always be ingested with caution. If planted in wet places in the garden it can become aggressive. It "can cause upset stomach of taken without food." EDIBLE LEAVES: The edible leaves are very bitter. I have Vietnamese friends here in Florida who love to grow it and add the entire aboveground flowering parts sparingly as a bitter green to salads. MEDICINAL HISTORY: It has "been written about for over 7,000 years" in India.  " SIDE EFFECTS: Refer to webmd.com for a list of side effects. It "can cause upset stomach of taken without food." AQUARIUM PLANT: It is a popular aquarium plant. DESCRIPTION: A low growing, non-aromatic, small wildflower. 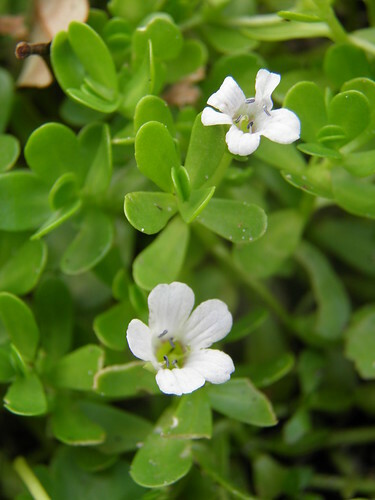 - It is very easily confused with Tropical Water Hyssop, Bacopa innominata, which also grows, less commonly, in scattered counties across Florida. In fact, I must look into the differences, as some of my photos may prove to be innominate. 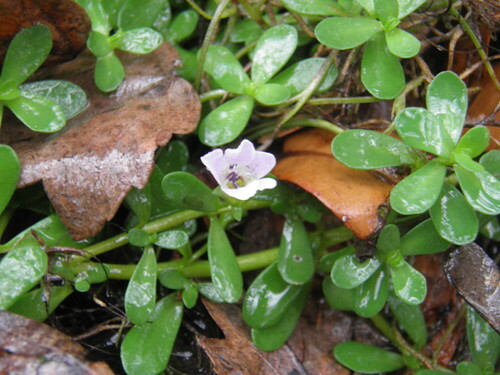 - It is also similar to the Swamp Twinflower, aka Lake Twinflower, Dyschoriste humistrata, which is more upright, and the flowers have a slightly more elongated tubular shape. It grows from Sarasota and DeSoto counties northward in Florida to Liberty county. Native. - Purslane has similar leaves, but has yellow flowers. Some native plant nurseries in Florida sell it.